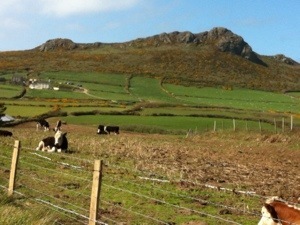 One rocky hill dominates the city of St David’s: Carn Llidi. Though it isn’t particularly high (less than 600 feet) its craggy summit is rarely out of the viewfinder of cameras pointed at the cathedral or other buildings, and it’s visible for miles around in the flatlands of the peninsula. This afternoon – the morning was taken as R&R – C. and I are joined by H. and by our friend A. from Swansea. The Celtic Coaster bus takes us to Whitesands Bay and we walk north round St David’s Head, past the exposed neolithic chambered tomb Coetan Arthur, then cut across rough country towards the north shoulder of Carn Llidi. Scrambling to the rocky summit you’re rewarded with a huge prospect to Strumble in the north and views across the whole peninsula in other directions. ‘Llidi’ is a mysterious word. Neither ‘llid’ (anger) nor ‘llidiart’ (gate) seem to fit the place. What is certain is that it’s a windy hill: today it’s barely possible to stand upright on the summit. As we descend to the south Carn Llidi stands out proud and elegant against an unexpectedly blue sky, with a necklace of yellow gorse above the patchwork fields. We return to Whitesands, and very likely the end of our coastal walk: tomorrow is predicted to be a day of high winds and heavy rain. We’ll need to fill in the gap between Aber Mawr and St David’s Head on another day. And so ends part 1 of our exploration of the Wales Coastal Path: a challenge to the muscles and tendons, a renewing of old friendships, and a celebration of sea, rock and flowers.